12-year-old John stood barefoot on a cushy black mat, staring up the length of the coral-colored aerial silk attached to the ceiling of the two-story gym. He gave his shoulders a little shake, took hold of the two lengths of silk a foot above the knot tied at the bottom and reclined back into them, like putting on the straps of a backpack. Taking a deep breath and furrowing his brow, he kicked backward off the floor. In one fluid motion he was hanging upside down, arms and legs sprawled out like a starfish. After another deep breath, he looped his ankles through the middle and hoisted himself into a sitting position, supported by the fabric wrapped around his thighs and torso, six feet off the ground. Beaming, he asked his instructor to spin him around. His mom was sitting in the bleachers and he wanted to make sure she could snap a good picture. This was his first time performing this feat. For John and 50 other Point Lay students, the circus had officially come to town that day in mid-July. Instructor (and veteran circus performer) Matthew Duncan greeted them at the door of the Kali K-12 School in Point Lay. "Ladies and gentlemen, boys and girls, welcome to the North Slope circus extravaganza," Matthew said, his voice echoing off the walls of a room that sees far more basketball and volleyball games than big top spectacles. But during that same two-hour session in the gymnasium kids of all sizes acquired new circus skills. Like all good traveling circuses, the camp had three rings where the performers-in-training honed their techniques. To the left of the central aerials station, the troupers tested out a medley of juggling gear. Some tossed airy, slow-moving scarves and squishy, bead-filled balls in primary colors. "Most excellent," cried their instructor, after they had mastered a few rounds without their circus accessories falling to the floor. Others, like Teri, who had a fresh foot cast from a basketball-related injury prohibiting her from participating in the aerial arts, experimented with flower sticks. "I don't mind just juggling," she said, never taking her eyes off the sticks she was twirling. "I just get to try more kinds. And I'm already getting good at this." To prove it, she performed a trick that had the baton whirling around one of the handsticks like helicopter blades. Then there was Jeremy, standing stationary in the middle of the frenzied dance of practicing pupils all fixated on keeping their tools in the air. Casually, he spun a green plastic plate on the end of a long wooden stick. With the greatest of ease, he hoisted the plate into the air mid-spin, rotated the stick 180 degrees and caught the plate on the other end in one flowing movement. Around the outer edges of the rings, some of the kids learned to walk on a pair of yellow stilts, donated by woodshop students in Barrow. Strapped in with rainbow-striped velcro, the now two-foot-taller youngsters moved robotically around the gym. In the rightmost ring, a gaggle of younger students crowded around a cafeteria table. They were looking at pictures of other young faces painted with green tiger masks, pirate accoutrements and wild, unruly faux moustaches. 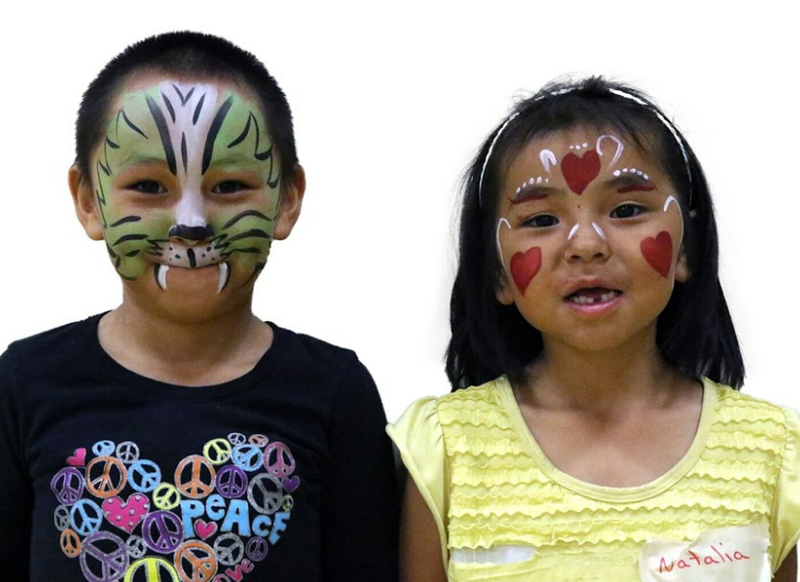 The Point Lay kids tried to sleuth out which of their North Slope friends were under the makeup. You see, this wasn't the only circus camp to hit the North Slope this season. Barrow saw a two-week version of the camp in early June and the two weeks following Point Lay were divided between Point Hope and Wainwright. The North Slope camp has actually been around for eight years in Barrow and has alternated between the three villages and four other communities (Anaktuvuk Pass, Atqasuk, Kaktovik, Nuiqsut) each summer for the last six. The program is made possible by a joint partnership between the Samuel Simmonds Memorial Hospital diabetes prevention program, Ilisagvik College and the City of Barrow. Diana Solenberger, the Cooperative Extension Coordinator for Ilisagvik College, frequently organizes programs for the communities she serves—from financial literacy seminars and crafting workshops to tai chi classes and walkathons. But in the summer it's all about engaging with kids and getting them moving. Just this summer there were camps for gymnastics, filmmaking, machine engineering, drama, cooking and circus. "My main hope is that the kids can get active and learn there are fun ways to do so," Diana said. "These are new things to them and they all find something that they are successful at that they might not have otherwise found." Matthew said the variety of components offered are what make the camp so unique. Unlike standard sports camps, where the attendees vie to be on the best teams, circus camp is non-competitive. "It's all very collaborative," he said. "We get the kids to work together and everybody finds their niche. Nobody has to do one thing. They can be any variety of performer." Over the course of each day, four different age groups descend on the gym. First the 4-year-old and under crowd share an hour of silly stories, dancing like animals, tumbling and face-painting. Then come the 5-7-year-olds, for an hour of simplified circus activities—a rare privilege, as most U.S. circus camps start at age eight. 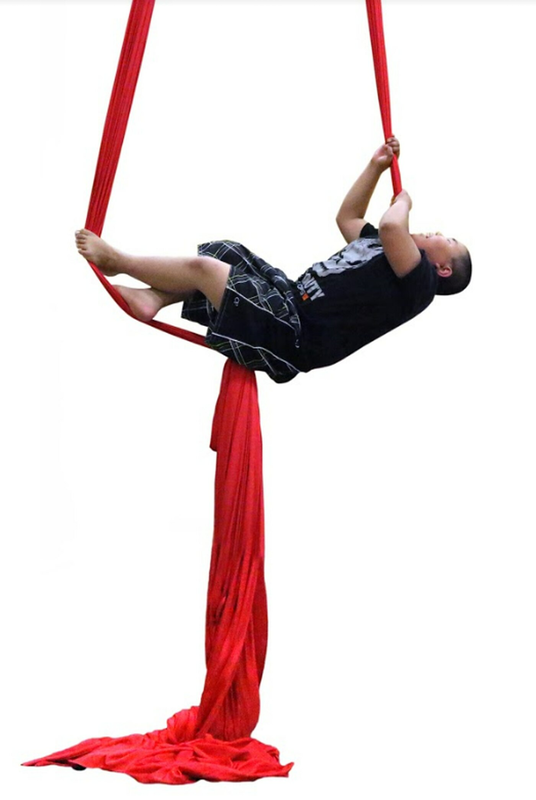 Then kids ages 8 to 11 go, followed by 12 and up for two hours each of more refined three-ring skills, like stationary trapeze, aerial silk performance, juggling, walking on stilts and clowning. Though the camp only visits Point Lay every other year, the kids were eager to show their instructors that they hadn't forgotten what they'd learned in 2014—showcasing the cartwheels they'd mastered and the acrobatic stunts made possible by newfound muscle mass. "Did you bring the natural disaster game?" John asked during stretches. "That was two years ago, you still remember that game?" Matthew said. John and the other kids nodded eagerly. Later Matthew asked if anyone remembered anything about juggling. Three hands shot skyward and one girl blurted out that the proper juggling pattern is in the shape of an "X." For many Point Lay youth, the camp is one of the few ways they can get active in the summer—the school gym usually isn't open. Sabrina said sometimes she and some friends will jump on a trampoline in a friend's yard, but more often the equipment is abandoned to the thick clouds of ubiquitous mosquitoes. "In the summer there's not much going on here," Diana said. "They're a captive audience. Sometimes they'll go camping upriver, but that's more on the weekends, so they spend a lot of time watching TV. These camps are interesting ways to get them active and moving." But the camps have also pushed kids to be more active in the off-season. One Barrow attendee a few years back desperately wanted to do aerial and tumbling routines, but was a little heavier and didn't yet have the strength to support herself during complicated maneuvers. But she kept working at it. Every time she saw Diana (who also lives in Barrow) around town, she'd be quick to show her how her cartwheels were progressing. By the time the next camp rolled around, she was ready for the high-flying aerial fun. "I've also had parents in Barrow tell me they could tell their children have gotten stronger after just the camps," she said. "They could see it in their shoulders and arms after a week." Camp leaders also hope to instill the importance of healthy diets. During snack time on the first day, the campers were allowed one graham cracker and as many peppers and carrots as they wished (both to eat and to do their best, "What's up, Doc?" Bugs Bunny impressions). Picking at the bowl of produce, one little girl told Diana that she thought you only ate vegetables if you wanted to start a diet. "No, vegetables are always good for you," Diana reassured her. "They make it so you don't need to diet." Sandy Solenberger, another instructor and Diana's mother, said that because fruits and vegetables can be so astonishingly expensive on the North Slope—a five-pound bag of apples can run as much as $35—many kids don't have the chance to experiment. Pushing boundaries has always been a major theme throughout the week. While some students contend with overcoming shyness or self-consciousness, others best physical limitations. On the first day, Diana asked the kids who wanted to do the "coffin move" on the trapeze: crickets. "That looks hard," Anna finally said. "A lot of things at circus camp are hard the first time," Diana said. "That's why we try so many new things, so we can find one that's just right for you." "One of the things we tell our counselors is that you're never allowed to say something is easy to a child," Sandy explained. "Because if they succeed, it doesn't mean anything, because it was supposed to be easy. If they fail, they feel badly because it was supposed to be easy. 'Yes, these things take practice' is what we're trying to say." Diana recalled one camper at a prior camp who sobbed when it was her turn to do the stationary trapeze. "She hugged me and begged me not to go," Diana said. "We said, 'OK, let's get your toes up on the bar' and that was fine, so she wrapped her knees around the bar. Soon she was swinging upside down no problem and having so much fun using the trapeze." But on day two, when Diana asked who wanted to do the aerial "diaper move" (the move that John quickly mastered), the students jumped at the chance to be first. After class, Diana excitedly told the other instructors that she thought her aerial students will be up for doing drop moves in the silk the next day. It's an uncommon accomplishment—the moves are inherently scary and require a high pain tolerance—especially in so few days. In the last four years, only a few students from two other communities were able to do those tricks. In Barrow, because the camp is twice as long, the group is able to put on a show at the end of the second week where the students are the main attraction. Wearing shirts they tie-dyed together the previous week, the students showcase their juggling, clowning, aerial acrobatics, tight rope walking and gymnastics. "I always have parents come up after and say I never knew my kids could possibly do that," Diana said. "One mom heard we were doing a show and was like, 'Hmm, a kids show, OK.' She was skeptical. But then she saw it and was blown away. She told me, 'I couldn't believe it. It wasn't just a kids show, it was an actual, real show.'" In Point Lay, even from an outsider's perspective, improvements were obvious from one day to the next. Kids were more confident. Both in themselves and their abilities. That, Sandy said, is what she's hoping the kids take away from the week: a sense of possibility. This article was sponsored by Alaska Native Tribal Health Consortium and originally published in 61°North – The Arts Issue. Contact the editor, Jamie Gonzales, at jgonzales@alaskadispatch.com.